Each year, I try to find some new and interesting activity for my incoming students (they arrive on Wed, although a few have begun blogging at our classroom blog already .. cool). This breaks the ice, gets them engaged in an activity and allows me time to wander and have conversations with them. This year, I decided I will show them Pivot Stickfigure and have them create a short stopmotion movie using the letters of their first name. Pivot (a free download, by the way) is always a huge hit with students, and I am curious to see how tech-savvy they are in the first few days. With pivot, you can export the final movie as an animated GIF. Or use it in Moviemaker (I won’t go that far with them yet, however). And no one read a book? 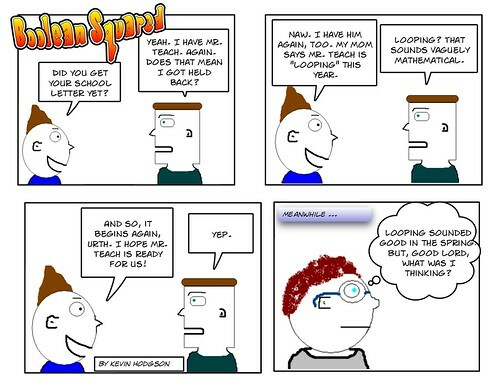 This is the last of my Back to School comics of Boolean Squared, as Mr. Teach surveys his class on summer activities. 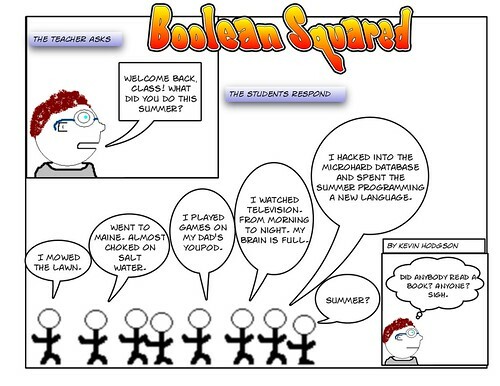 In my comic, Boolean Squared, the teacher — Mr. Teach — is looping with his students this year — meaning he is going with them to the next grade as their teacher. OK — so, this narrative device allows me to keep Mr. Teach in the picture for another year. I didn’t want to lose him. What happens to Boolean Squared? 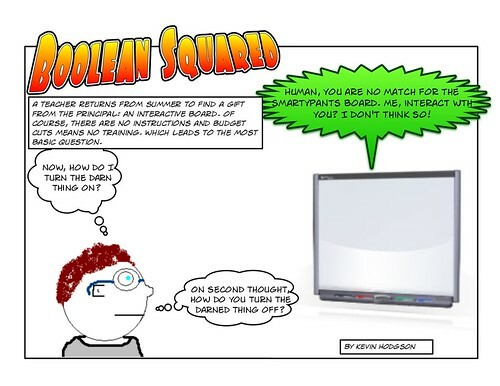 As some of you know, I worked out an arrangement with our regional newspaper to publish my webcomic, Boolean Squared, last year and it was a fun adventure. But, this year, with cutbacks, layoffs and other things going on at the newspaper, we decided to end the relationship. It’s a bit sad, but not too much. I accomplished what I set out to do: publish a comic about teaching and technology in a newspaper. 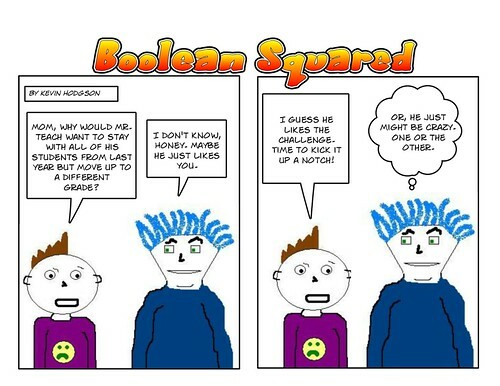 So, now I am figuring out some self-publishing possibilities and for now, as I create new comics, I will post them here at this blog first and then add them to my Boolean Squared website. I may eventually set up a Boolean Squared blog so that there is an RSS feed for folks. I found out this week I have a Promethean Interactive Board in my classroom now. It’s ironic, because they have to cut part of my chalkboard to make room for it. Getting rid of the old to make room for the new? I created this video book recommendation for a site within the National Writing Project, but thought it would be neat to share here. The book is called Not Quite What I Was Planning, put out by Smith Magazine. Yesterday, Bonnie and I launched our experimental network for teachers in the New England/New York areas who are connected to our National Writing Project. We’ve called it the iAnthology, in reference to the eAnthology writing network that runs all summer for teachers involved in the four week training of the National Writing Project. To be honest, we weren’t sure if anyone would come and get involved, but as of this morning, we have 35 members. That’s more than I would have thought and that was just in the first day. The network is not open to the general public (sorry) and we have a mix of new tech users and veteran tech users. Our goal here is to use Web 2.0 tools to keep us all connected and involved in the work of the National Writing Project, which prides itself on developing teachers as writers and then writers as teachers. We believe that writing is at the heart of most learning. So, this is exciting and we hope the network develops into something special and useful for our teachers. I finally put the finishing touches on an eZine for work that our Western Massachusetts Writing Project did this summer with youths. The site — created with Yola — showcases some cool work, including videos, writing and more. 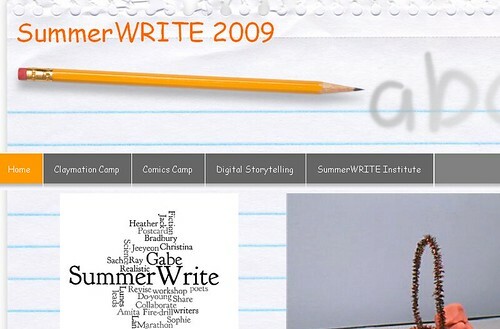 You can see for yourself by going to the SummerWRITE 2009 eZine site. 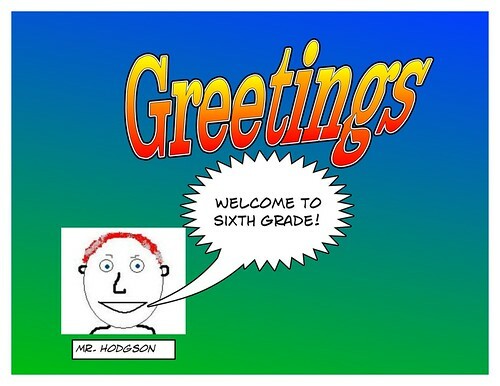 … I am waking up in the middle of the night, thinking about the letter I want to send to all of my new students, welcoming them to sixth grade. And, also, I know we are getting close when I start cleaning out and cleaning up our classroom weblog (should I do a new theme every year? a pondering question) and create a new post for students to write about their summer experiences before they even set foot in the school. My mind is getting ready. I can feel it. This comes from Found Magazine, which is worth your time. You’ve probably had a lot of teachers who have fed you lessons and learning with little reason behind it. I know I did when I was growing up and it made me crazy. I hope I don’t do the same with you as your teacher, although there are going to be times when it may seem as if I am making you do things that are isolated and out of context. I hope to keep those activities to a minimum. Sometimes, we need to lay the groundwork for better things to come. I want you to care about what you are doing because caring people shape this world for the better. You may be young, but you have a voice, and I want to help you find that voice and use it as best as I can. You should care because your interest and curiosity now will set the stage for an intriguing life later on. You should care because all of us have something inside us that drives — all of us are poets, all of us are scientists, all of us are musicians — and you nurture that kernel of being by caring for the world and yourself. I can’t help you answer this question alone, though. You need to be on the journey, too, and let me help you with your explorations. Let me show you how caring looks and then maybe, hopefully, you’ll see how one person can impact another in a positive way.